When my maternal grandmother died, all of her recipes went with her. My mom doesn't remember her ever using a cookbook, and she rarely used clippings from newspapers and magazines. We're not sure how she learned to cook the amazing things she made, or how she remembered them all, but they were supposedly fantastic (she died when I was 2). My mom has tried off and on to recreate the dishes she remembers from her childhood, and Spanish rice is one of those things. Most of the rice served at Tex-Mex restaurants here in Texas is pretty dry, with some peas and carrots occasionally thrown in the mix. 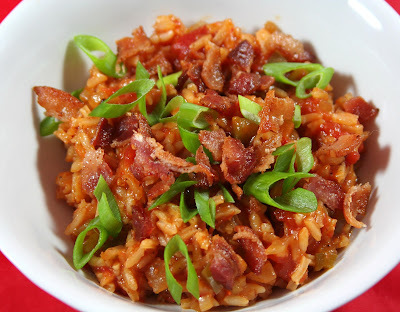 My mom remembers her mother's rice being rice and moist, with bacon on top. Sounds amazing, right? Well, we finally decided that this recipe from Better Homes & Gardens is probably as close as we're going to get. It meets all of the requirements and is pretty darn tasty. I mean, how can you go wrong with bacon sprinkled on top? If you're a Texan, you might need some additional spice (cayenne pepper maybe? ), but since my grandmother lived in Maryland, I have a feeling this dish is just right. In a 10-inch skillet, cook 8 slices of bacon till crisp; remove. Pour off half the fat. In remaining fat, cook 1 cup finely chopped onion, and ¼ cup chopped green pepper till tender but not brown. Add one 1-pound can tomatoes, 1½ cups water, ¾ cup uncooked long-grain rice, ½ cup chili sauce, 1 teaspoon salt, 1 teaspoon brown sugar, ½ teaspoon Worcestershire sauce, and dash pepper. Cover and simmer 35 to 40 minutes. Crumble bacon on top. Trim with parsley.